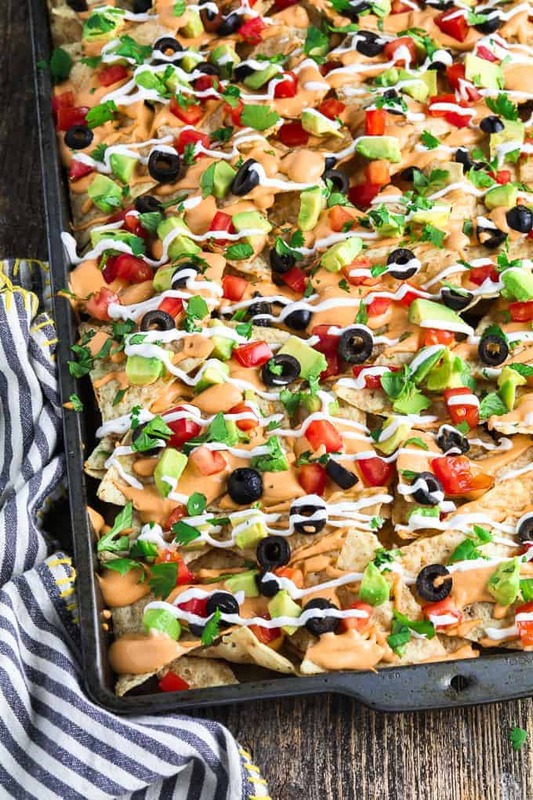 Easy and satisfying – these Fully Loaded Vegan Nachos are a hit with a hungry crowd! The combination of crispy tortilla chips, melted nacho cheese, tangy sour cream, and fresh toppings will make them disappear fast! Got a craving for something flavorful, filling and fun? 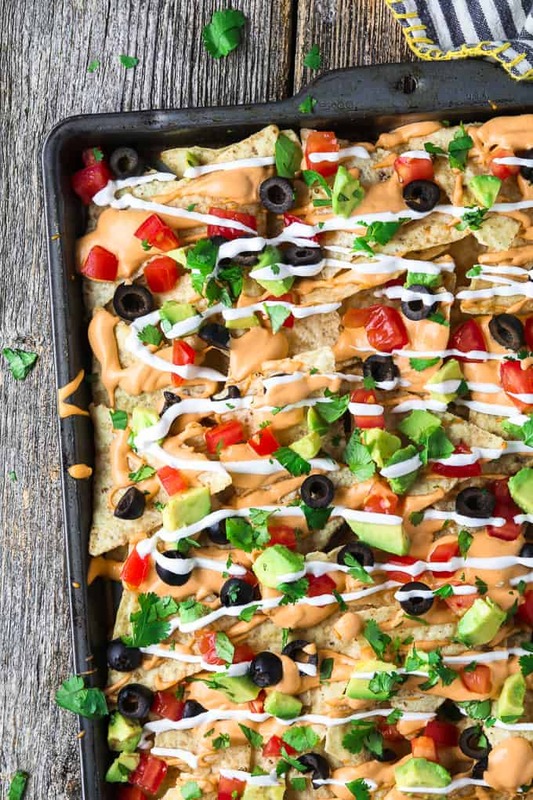 If yes, then you’ve gotta make these Vegan Nachos tonight! I loaded them up with my favorite toppings, but you can customize them to suit your own taste buds. There aren’t any rules when it comes to making nachos! You’ll definitely want to make them with my Vegan Nacho Cheese Sauce though. It’s really easy to whip up and tastes incredible! To start, You’ll need a large serving platter or Baking Sheet Pan (about 18X13). You can also use a smaller platter and make a double layer of nachos. It all works! Have all the ingredients prepped before you begin. Make the Vegan Nacho Cheese and cover to keep warm. Arrange the tortilla chips in one layer. Drizzle the cheese on the tortilla chips using a large spoon. Now add the tomatoes, avocado, black olives, Vegan Sour Cream, and cilantro. WHAT KIND OF INGREDIENTS CAN I ADD TO VEGAN NACHOS? Hot Sauce, Salsa, Green Onion, Jalapeños, Black Beans, Sliced Radishes, Diced Red Onion, Pinto Beans, Vegan Meat Crumbles, Guacamole, Pico De Gallo, Frozen Corn (thawed). CAN I BAKE THESE NACHOS? I didn’t find it necessary because the cheese is warm and melty. Plus, the ingredients I chose didn’t need warming. However, if you added ingredients that need warming, or just want crispier tortilla chips, you can bake the nachos at 400 °F (200 °C) for 5-10 minutes. I would leave off the avocado, vegan sour cream, and cilantro while baking though. 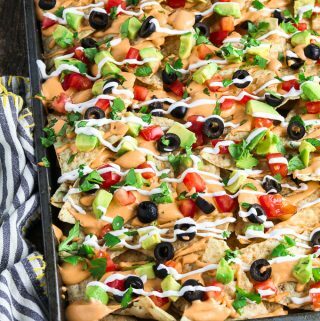 If you make these Vegan Nachos, let me know what you think by ★ star rating it and leaving a comment below. It would really make my day. You can also follow me on Instagram and share your creation with me. Just tag me @veganhuggs and hashtag #veganhuggs so I don’t miss it. 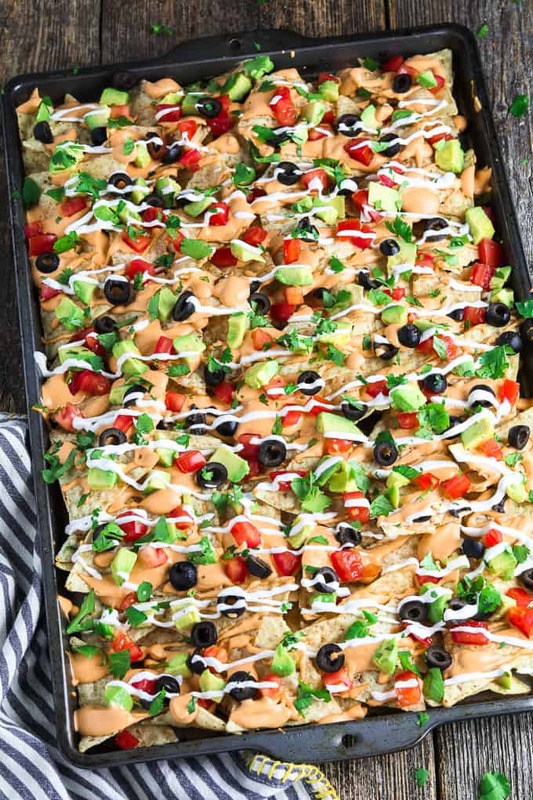 Easy and satisfying - these Fully Loaded Vegan Nachos are a hit with a hungry crowd! The combination of crispy tortilla chips, melted nacho cheese, tangy sour cream, and fresh toppings will make them disappear fast! Have all the ingredients prepped before you begin. Make the nacho cheese sauce and cover to keep warm. 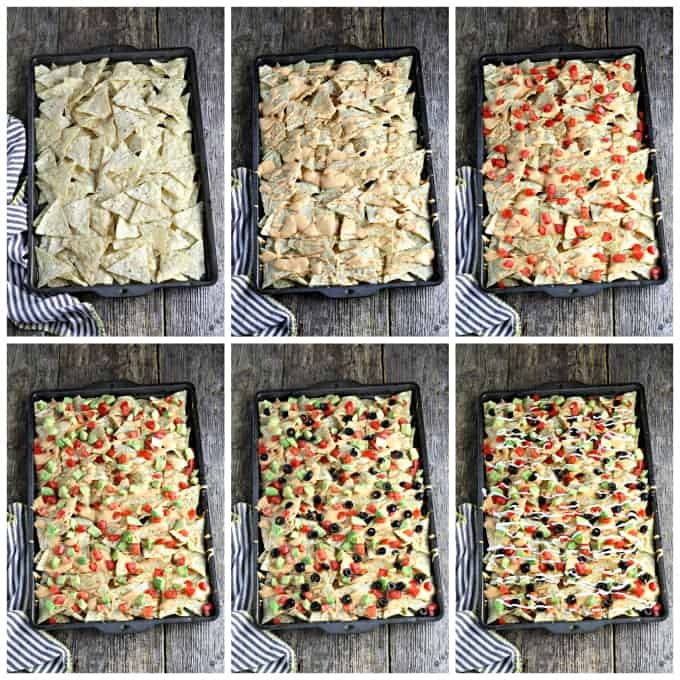 Arrange the tortilla chips in one layer on a large serving platter or Baking Sheet Pan. You can also use a smaller platter and make a double layer of nachos. Drizzle the cheese on the tortilla chips using a large spoon. Now add the tomatoes, avocado, black olives, vegan sour cream, and cilantro. *ADD-ONS & SERVING IDEAS: Lime wedges, hot sauce, salsa, sliced green onion, sliced jalapeños, black beans, sliced radishes, diced red onion, pinto beans. I made these last night and they’re soooooo good. I love the nacho cheese. Topped it off with a ton of chalula too!